Tag line: "A New Dimension In Terror..."
Trivia: Larry Zerner was cast as Shelly in this movie when the producers spotted him handing out fliers for a horror movie and asked him if he'd want to star in one himself. Okay, so Part One gave us the legend, and Part 2, the killer. What's left for Friday the 13th Part 3? That would be the headgear. Friday the 13th Part 3 marks the first time Jason appears in his now-infamous hockey mask, a disguise he would wear in every one of the remaining sequels. Friday the 13th Part 3 picks up a day after the events of Part 2, with Jason still on the prowl in the Crystal Lake area. Not realizing the danger, a group of young people take a weekend trip to a cabin in the woods. Oddly enough, one of the group, named Chris (Dana Kimmell), actually survived an encounter with Jason just a few years earlier, and is still haunted by the memory of it. Unfortunately, she's about to come face-to-face with her darkest fears once again. 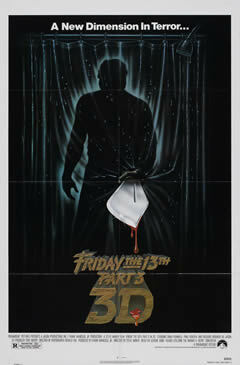 As in Part 2, Jason doesn't limit himself to slaughtering teens in Friday the 13th Part 3. In fact, his first two kills are a shop owner named Harold (Steve Susskind) and his annoyingly nagging wife, Edna (Cheri Maugans), who's abruptly, and quite appropriately, stabbed through the mouth. But as it is with all the films in this series, it's really about the kids, and this particular collection of young people is the most annoying to date. Along with a couple (David Katims and Rachel Howard) who spend the bulk of their time getting high, there's Andy (Jeffrey Rogers), who tries to impress everyone by walking around on his hands (leading to what is certainly the film's best kill scene) and Shelly (Larry Zerner), a chubby, gawky kid who draws attention to himself by putting on make-up and pretending to be violently murdered (although, as you might expect, he doesn't have to pretend for very long). It was hard to feel any sympathy at all for these kids (with the exception of Chris, mentioned above, and her boyfriend Rick, played by Paul Kratka, who are at least given a little depth), and in some cases, as horrible as it may sound, you didn't mind seeing Jason perform his mutilating magic on them. Released in 1982, Friday the 13th Part 3 was originally presented in 3-D, and I have to admit the effect was a real distraction, with objects constantly flying towards the screen (along with those items you might expect to find lunging at you, like knives and arrows, there's also yo-yo's, juggled fruit and even an eyeball). Still, the 3-D wasn't enough to ruin the experience, and Friday the 13th Part 3, though a small step below the first two, proved an entertaining addition to the series. i would like to subscribe to your rss but notice it is for all types of movies : is there a way of just subscribing to this horror section? First off, with Friday the 13th Part 3, I absolutely agree with you. I also have the 3-D Blu-Ray, and it' phenomenal. The 1st four FRIDAY movies are genuine classics of the genre; gory, scary, and oh so entertaining! As for the RSS feed, Unfortunately I don't believe there's a way to subscribe just to Horror. However, you've given me and idea: I'm going to ask Billchete to change to link on the PLANET MACABRE site to take those who click on it directly to the horror section, bypassing all other genres. Obviously, I'm a film fan, and love all sorts of movies, but those who visit my site from PLANET MACABRE are looking for one think...HORROR! It seems like the only fair thing to do is take them directly to it! Those who want to see more than horror will, of course, still be able to do so by clicking the various links on the menu to the right. Thanks for giving me the idea. I appreciate it! And thanks also for the kind words, and for listening to Planet Macabre! Next to Part 7, this movie has my favorite "final girl"! Alonzo665: She was one of the stronger "survivors" of the series, to be sure. Thanks for stopping by, and for the comment!